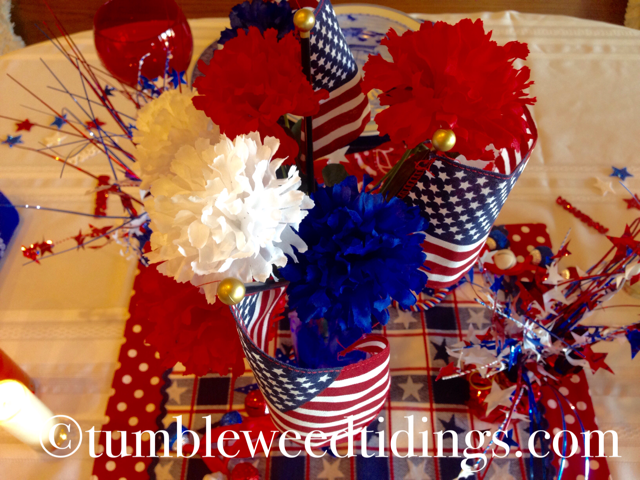 Welcome to Tumbleweed Tidings this Fourth of July week! 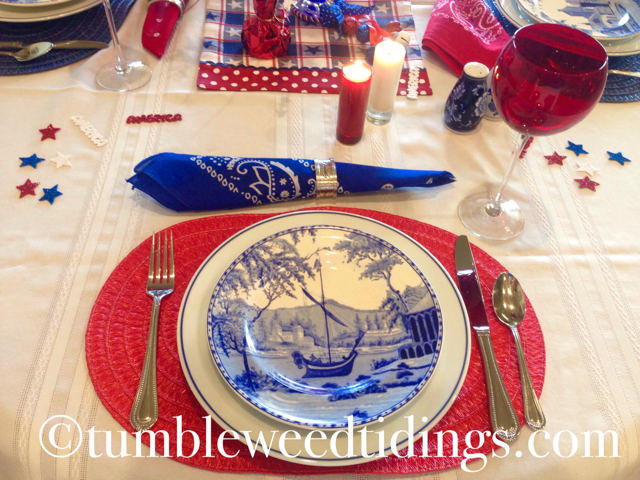 Today, I’m sharing an easy, yet festive, tablescape for this patriotic holiday. I don’t know about you, but regardless of the occasion, I always feel that the table is the perfect opportunity to make any gathering even more special. All it takes is putting out a few colorful items that reinforce the holiday or theme of the event and voila, you’ve got yourself a party! 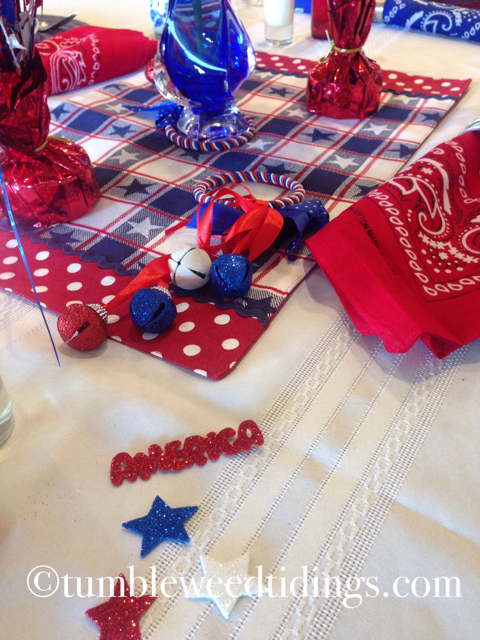 Case in point is this “thrown together” Fourth of July tabletop. Creating something like this is very easy, and today I will walk you through the process, step-by-step. First, start with a table cloth or runner. In my dreams, I wanted a blue and white striped cabana-style tablecloth, but didn’t have time to find one or buy the fabric to create one. So, cue the plain white tablecloth, one of about 8 that I have left over from our oldest daughter’s wedding over 13 years ago. Boy, those things have come in handy over the years! Next, I got down my patriotic bin. I try to allow myself one storage bin for each of the holidays, and they are lined up on a closet shelf, just waiting for their day in the sun. One bin works great for Valentine’s and one for the Fourth of July. Easter takes up two bins, Fall and Thanksgiving takes up three, and Christmas….well we don’t even want to talk about my favorite holiday. Even after thinning it down year after year after year, our Christmas boxes are 6-8 strong and occupy much of the shelving my husband installed in the garage. But back to my patriotic bin. Over the years, I have collected a variety of red, white, and blue decorations and they are all in this bin. 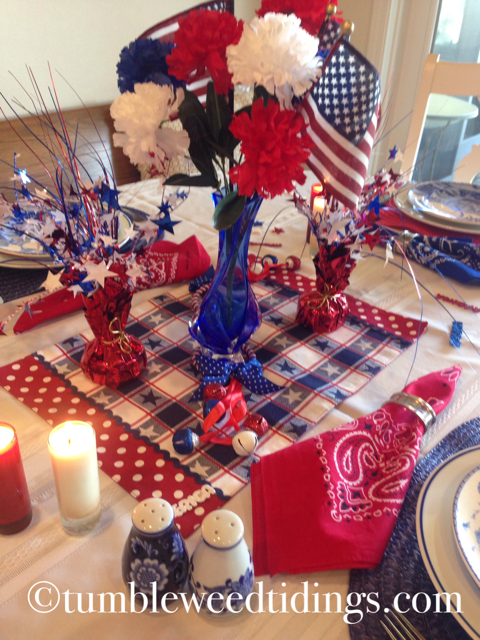 To anchor the table, I chose a stars and stripes placemat, which I topped with a blue vase filled with red, white, and blue carnations and some American flags. 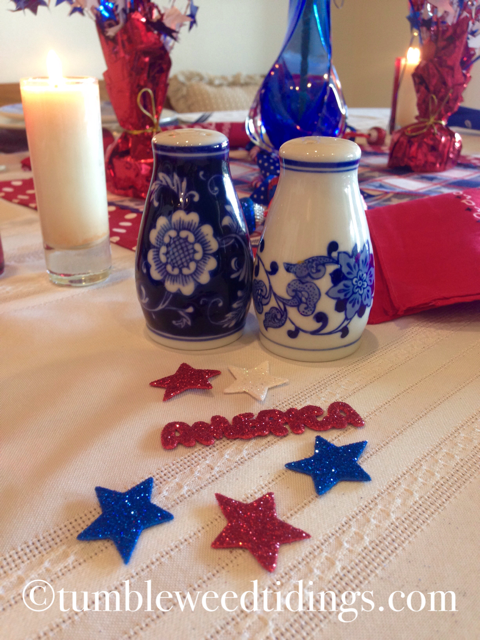 I flanked the flower arrangement with some firecracker looking pieces that were found at the Dollar Tree years ago. 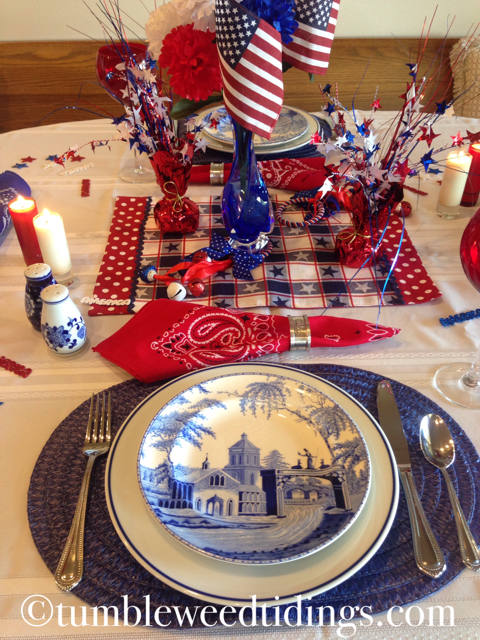 For the place settings, I used two red and two blue woven placemats, again from the Dollar Tree. Lucky for me, my everyday dishes are white with a blue rim, and last year I purchased these salad plates from Pottery Barn that work great with the theme. 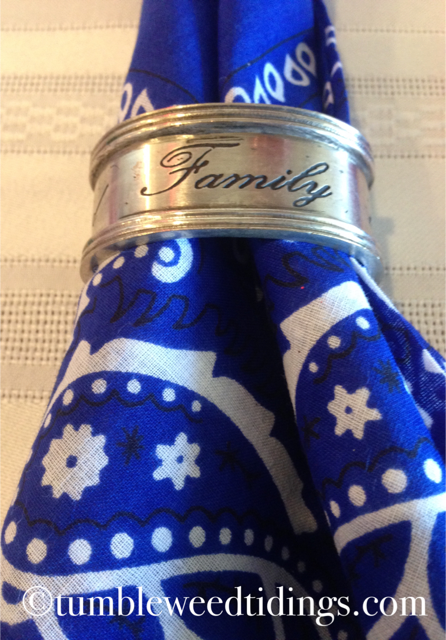 For napkins, I alternated red and blue bandanas, left over from a Night in the Wild, Wild West dinner I put together at our church a few years ago. Bandanas work great for this application and most any other! They come in a myriad of colors and wash up like a dream with no ironing. 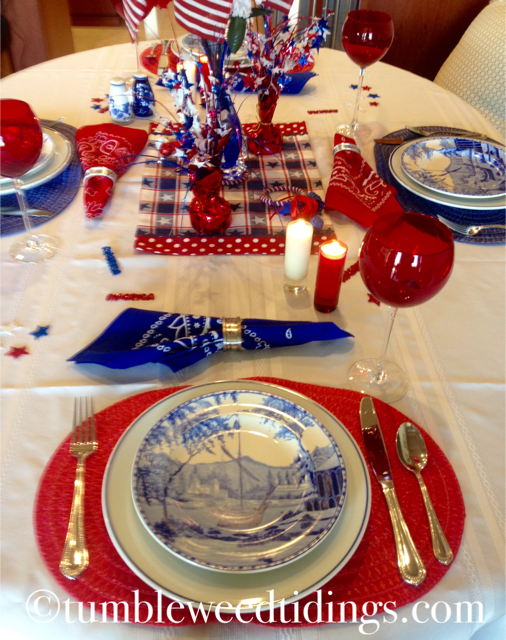 To complete the table setting, I used four large red wine glasses that my mother got me for Christmas years ago. They are beautiful, and I’ve used them over the years with tea lights in them, as well as for beverages. Lastly, I sprinkled around some glittery confetti that contained red, white, and blue stars, as well as the word America. 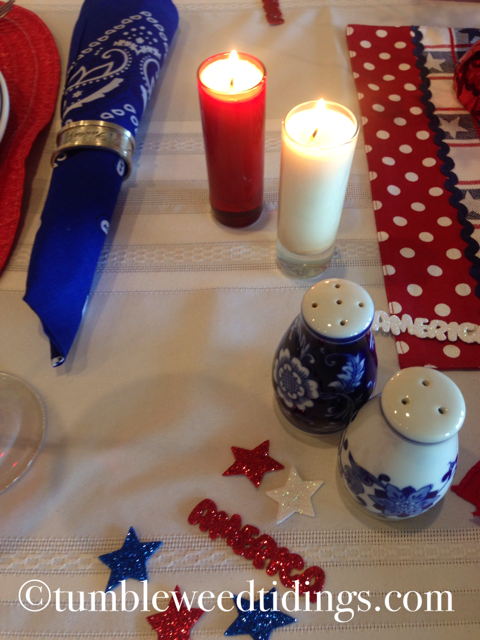 A set of blue and white salt and pepper shakers, some red and white candles, and it was done. The whole thing took about 10 minutes to create, and it evokes just the look I was going for. 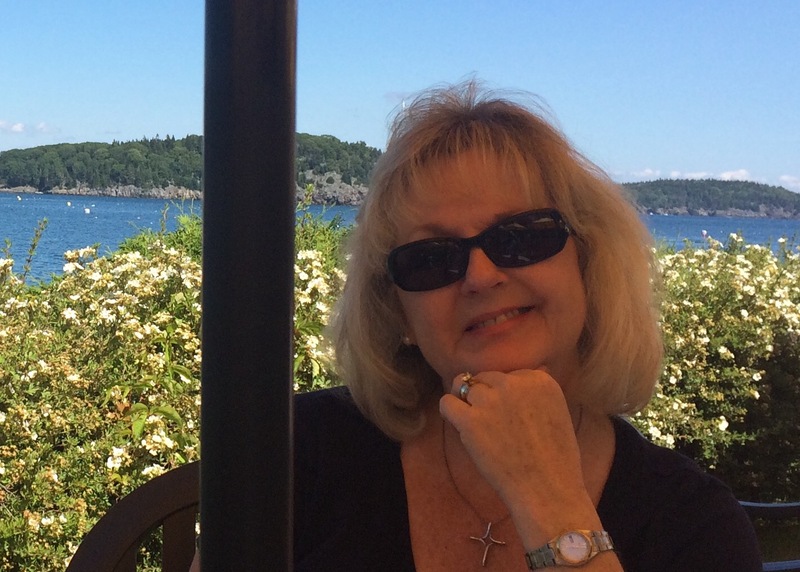 A few years ago, we hosted a nice Fourth get together here with some family and friends. Rather than use the decorations for a sit-down meal, I used the same principles, but created it as a buffet table. Instead of glass dishes, we used paper plates, napkins, and cups. Easier for a crowd and just as impactful. It’s actually fun to look in cupboards and drawers, trying to find things in a certain color scheme. I’m usually surprised at what I find, and you might be too. If you don’t have much holiday décor, a great place to start is at the Dollar Tree, where they seem to go overboard for each occasion, and many of their items are surprisingly good quality. Another great way to start accumulating holiday décor is right after the holiday has passed. Most stores want to clear that merchandise out right away to make room for the next season, and it’s not unusual to find after-holiday items for up to 70% off. Finally, don’t shy away from inviting people over because you don’t have fancy things. It isn’t about fancy, it’s about making it celebratory and fun, and ensuring that your guests are comfortable and feel special. Long after all of the fireworks are burned out, that feeling is what they will remember most. As always I enjoyed this very much. It is a great idea to put the Holiday items in a separate bin. I had forgotten about the red wine glasses. But I’m glad you could use them. I will just put a flag in the flower pot by the front door for my decorations.